This Guide is the know-all be-all guide when it comes to the 7 Days to Die Dedicated Server Client. By skimming through this guide, you will learn everything you need to know about your new GameServerKings 7 Days to Die Server. If you’re not currently a member of our services and you like what you see, head over to our 7D2D Hosting Page. 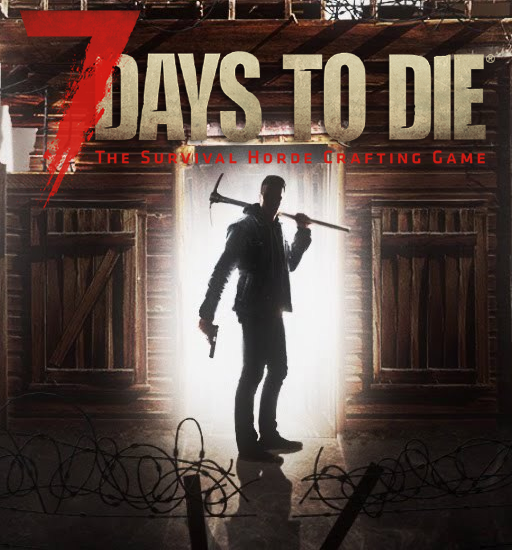 If you would like to read more guides and articles, check out our 7 Days to Die Knowledge Base for more information. At GameServerKings, we like to make everything about your user experience quick, simple, and efficient. To do this, we employ the usage of the TCAdmin control panel. To connect to your server via your control panel, simply navigate to manager.gameserverkings.com and log in with the information provided to you within your purchase verification email. From here, you will have access to a slew of tools to help you administrate your server. Knowing your SteamID information is very important when administrating your server. Using a user’s steam name, in some cases, is not enough to verify the user isn’t another user who just changed their name. To find your SteamID and your SteamID 64, simply go to steamid.io and enter your steam community profile URL. Then, press look up. It will show you your Steam ID, SteamID3, SteamID64, and your custom URL. You can use this information to set up administrator accounts, issue user permissions and more. Troubleshooting Startup Errors is pretty simple with 7 Days to Die. All you must do is log into your TCAdmin Control Panel. From there, navigate to your game service and then, open your web console (left). Your web console will show any error which occurs. A common error which occurs from time to time is the Enlighten Error. This is caused by our system which searches for the reason for the failure and notifies us. Nine times out of ten, this will be caused by applying a steam update without backing up your configuration files. If this happens, look over your configuration files and be sure that everything is set up correctly. To update your version of 7 Days to Die, first, log in to your TCAdmin control panel. From there, go to your game’s service, then go to configuration files. From here, open your Serverconfig.xml file and be sure to back up its contents. Occasionally, 7 Days to Die updates will cause your server’s main configuration file to break. We believe this is due to the steam validation install process. We have a backup process which will back up your files automatically when you update, but please manually backup your serverconfig.xml file before updating your server! Once you have backed up your serverconfig.xml file, simply go back to your server’s TCAdmin control panel and click “Steam Update.” A pop-up window will appear and your server will update to the latest stable branch build. In the case you wish to play on the experimental branch, please contact us via customer support ticket, we can set this up for you. In the case you were sent to this section of this guide if your server broke after an update, you must reconfigure your server to how it was before. If you can not do this, it is likely that you will have to regenerate your Random Gen map. Sorry! To connect to your new 7 Days to Die server, simply set aside your connection IP and Port. You can find this in both your billing panel and your TCAdmin User panel. A picture of where it is located from within the TCAdmin user panel is located on the left-hand side of this paragraph. Once you have your login information, launch your 7 Days to Die game client from within Steam. If you are not using Steam to connect to your 7 Days to Die server, or if you are EAC banned, you will need to disable EAC within your server configuration. From there, enter in your connection IP and Port which you set aside earlier. Click connect, and you’ll be in. Becoming a server administrator within 7 Days to Die is simple. First, you must retrieve your Steam64 ID. Please refer to the section of this guide about SteamID Information if you need to. From here, simply log into your TCAdmin Control Panel (Useful Links), go to configuration files, and open up your serveradmin.xml file. To add more administrators, simply add more within the admins tag. It is important to leave your permission level at 0, as 0 gives you access to all commands which are ranked higher than 0. Sounds backward, but that’s how it is. To edit your command permissions, simply log into TCAdmin (Useful Links), go to your configuration files, and open your serveradmin.xml file. From there, you should see a list of admins, as well as a list of commands that users and admins can use. By default, you should have access to all of your commands which are not given to you by mods if you are permission level 0. The way command permissions work for 7 Days to Die, the user must have an equal to or lower permission level than the command. Any player not given a specific permission level in your serveradmin.xml file will have a default permission level of 1000. This means any user can use the command say, as it’s set to 1000. While, only users whose permission level is greater than or equal to 0 (by default, this can be changed) has access to cp. To whitelist your server, simply log into TCAdmin, go to configuration files, then to serveradmin.xml. Within this file, you will have access to permissions, admin accounts and more. If you have even one user whitelisted on your server, this means your server is whitelist only. You must add all players who will play to your serveradmin.xml file manually. You may access this command via Telnet or the in-game F1 console. The unit of time value can be represented in minutes, hours, days, weeks, months, or years. To hard config a permanent ban, you can also manually add it to your serveradmin.xml file. To access your serveradmin.xml file, log into TCAdmin, go to your game service, and click Configuration Files. From there, open serveradmin.xml with the text editor. The reason for the ban will be broadcasted to the user when they try to connect to the server. To permanently blacklist a user, I recommend setting your unban date to any time in the year 3019. This will ensure that they are permanently banned. Be sure to leave this value within one line, as XML in this format is unable to read new lines. Telnet, short for Terminal Network, allows you to connect to your 7 Days to Die server on a remote connection. There are many ways to access your 7 Days to Die Remote Console. In this guide, we will cover three common setups. To find your Telnet IP and Port is simple. All you must do is log into TCAdmin and go to your 7 Days to Die game service. From there, it will be listed next to your RCON Info. If for some reason it is not shown to you, your Telnet IP is the same as your connection IP. Your port will be two numbers higher than your connection port. For example, if your connection port is “26911” your Telnet port will be “26913”. While you’re here, verify that the value for the property “TelnetEnabled” is set to “true”. If it is not, you will not be able to connect. Save your file, and start your server again. To connect to your server using PuTTY, first install PuTTY from their website. From there, open PuTTY and insert your IP in the Host Name (or IP address) box. Next, place your Port inside of the box labeled Port, then verify your connection type is set to Telnet. After that, you may save this session if you like. Simply name it under the “Saved Sessions” text box, then press Save. Now you can connect. Press “Open” at the bottom of the PuTTY Client. A terminal window will appear. You should now be connected to the server and it should be asking you for your password. Please refer to the “Setting up Telnet Password” section of this guide for more information. Once you’ve entered your password, press enter. You will now be able to apply changes and stop your server from your Telnet client. Although this step requires you to go through more steps to connect, the advantage to using the Windows 10 Telnet Client to access your 7 Days to Die server, is that you can connect from any Windows 10 computer. If you are out with some friends and a problem arises, you can simply set up the Windows 10 Telnet Client to run, then you will have access to your server. To enable the Windows 10 Telnet Client, please follow the steps on this Microsoft wiki article: Windows 10 Enabling Telnet Client. Now that you have enabled your Telnet Client, simply open the windows command prompt by typing Windows Key + R. This will open a run window, type “cmd” to run the command prompt. From there, type telnet and hit Enter. You will now be in the windows telnet client. Now that you have the telnet client open, simply type “o IP Port” This will open a connection to the telnet server. An example would be “o 255.255.255.255 26913” Next, all that needs to be done, simply type in your password and press enter. Once complete, you will have telnet access to your server. You will now be connected to your telnet session. Simply provide your password and you will have successfully logged in to your 7 Days to Die Telnet based remote console. You should now be connected. Simply input your password and you’ll be connected to your 7 Days to Die Remote Console on your Mac Terminal. Thank you for reading this guide. If you need any help, please do not hesitate to reach out to us through a customer support ticket. If you are a customer of ours, all you need to do is log in to your client area, click on support, then make a new ticket. A representative will be with you shortly. Kind Regards from GameServerKings.